It's seven o'clock in the evening. Our nightly viewing of In the Night Garden is finished. Punky and I have sung the Giggle & Hoot good night song together. 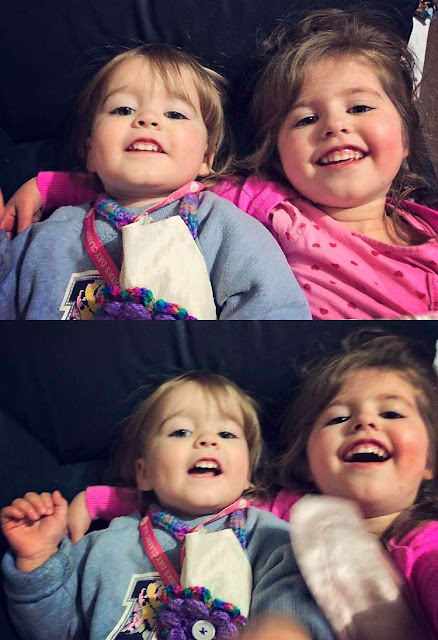 I'm sitting on the lounge with both girls, tickling and laughing. Spending some time with them before bed and quiet time. The girls love to be tickled. Love it. When I'm tickling them they say stop. But as soon as I do, they are saying "Again! Again!". I am always happy to oblige. Call it a hangover form being the biggest sister, but I just love to tickle! I love this time before bed. Before quiet time. When both girl's are happy and just want to play with me on the lounge. I glory in their giggles. Delight in finding the sweet spot, their most ticklish places. When they're lying side by side on the lounge, looking up at me with their big smiles and expectant eyes, waiting for the tickle monster to emerge, I often find myself wondering how I got so lucky. Two girls. Two beautiful, kind, caring, smart and funny girls. My daughters. The Purty Sisters. So alike, yet so different. Chalk and cheese. Some days they look so alike, their expressions mirroring the other. 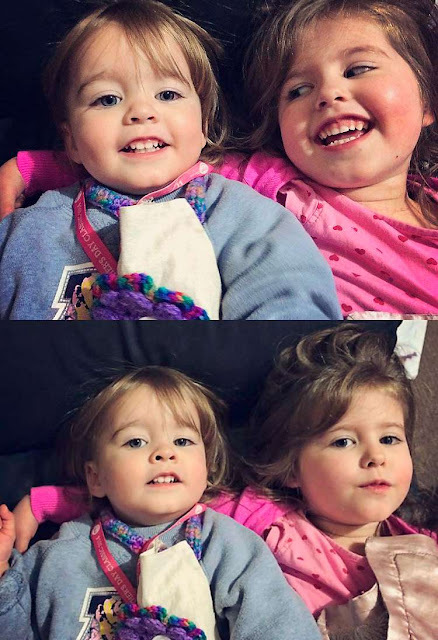 Some days they couldn't look more different, smiles and frowns, one girl as cheeky as the day is long, the other serious, bossy, telling her little sister how things should be done. The daycare teacher tells me often how she just can't believe the difference between the two girls. She had Punky when she first started there, before Zee was even born, and now she teaches Zee. She remarks on how serious and shy Punky was, how cheerful and cheeky Zee is. And she's not wrong. In their own way they've taken the best and the worst of Dave and I. In looks, we each have our own mini-me. In temperament it's pretty much the same way. But in both girls there lives a beautiful soul, an individual soul. Uniquely theirs. We see the things we love about ourselves, but also the things we don't. And it's not a bad thing. As we teach them how to deal with those aspects, we also learn how to deal with them ourselves. As we sit and laugh together on the lounge each night I'm reminded of how precious life is, how lucky I am to have two beautiful children. And despite the hard aspects of raising small people, I wouldn't have it any other way. I've had a few perfect moments lately but haven't actually managed to capture the moment. We have one final day of school holidays. I've been enjoying the lack of routine and more than a few lazy days. Hubby even managed some rare time off. We didn't really do much but it was wonderful just spending quality time as a family. I didn't want it to end. They are gorgeous, like little dolls. They are so precious. I love that special time together before bedtime too. When they say "stop", I say "stop what?". When the say "tickling" I start tickling again. Love those giggles, and sometimes I don't even have to tickle, I just move my hands and they start!